The YARN Applications page displays information about the YARN jobs that are running and have run in your cluster. You can filter the jobs by time period and by specifying simple filtering expressions. Select Clusters > Cluster name > YARN service name Applications. On the Home > Status tab, select YARN service name and click the Applications tab. The YARN jobs run during the selected time range display in the Results Tab. The results displayed can be filtered by creating filter expressions. Filter jobs that display. Create filter expressions manually, select preconfigured filters, or use the Workload Summary section to build a query interactively. See Filtering Jobs. Only attributes that support filtering appear in the Workload Summary section. See the Attributes table. View a histogram of the attribute values. Click the icon to the right of each attribute displayed in the Workload Summary section. Display charts based on the filter expression and selected attributes. Click the Charts tab. Send a YARN application diagnostic bundle to Cloudera support. Click Collect Diagnostics Data. 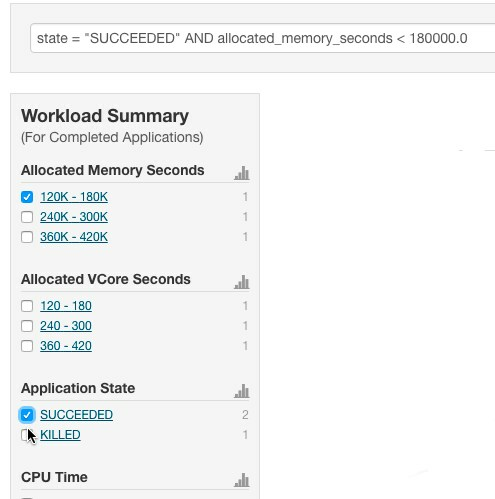 See Sending Diagnostic Data to Cloudera for YARN Applications. Export a JSON file with the query results that you can use for further analysis. Click Export. You can configure the visibility of the YARN application monitoring results. For information on how to configure whether admin and non-admin users can view all applications, only that user's applications, or no applications, see Configuring Application Visibility. Application Details – Open a details page for the job. Collect Diagnostic Data – Send a YARN application diagnostic bundle to Cloudera support. Similar MR2 Jobs – Display a list of similar MapReduce 2 jobs. User's YARN Applications – Display a list of all jobs run by the user of the current job. View on JobHistory Server – View the application in the YARN JobHistory Server. Kill (running jobs only) – Kill a job (administrators only). Killing a job creates an audit event. When you kill a job, replaces the progress bar. You filter jobs by selecting a time range and specifying a filter expression in the search box. You can use the Time Range Selector or a duration link ( ) to set the time range. (See Time Line for details). Attribute - Query language name of the attribute. Operator - Type of comparison between the attribute and the attribute value. Cloudera Manager supports the standard comparator operators =, !=, >, <, >=, <=, and RLIKE. (RLIKE performs regular expression matching as specified in the Java Pattern class documentation.) Numeric values can be compared with all operators. String values can be compared with =, !=, and RLIKE. Boolean values can be compared with = and !=. Value - The value of the attribute. The value depends on the type of the attribute. For a Boolean value, specify either true or false. When specifying a string value, enclose the value in double quotes. You create compound filter expressions using the AND and OR operators. When more than one operator is used in an expression, AND is evaluated first, then OR. To change the order of evaluation, enclose subexpressions in parentheses. Click the to the right of the Search button to display a list of sample and recently run filters, and select a filter. The filter text displays in the text box. Optionally, click Select Attributes to display a dialog box where you can chose attributes to display in the Workload Summary section. Select the checkbox next to one or more attributes and click Close. Only attributes that support filtering appear in the Workload Summary section. See the Attributes table. Start typing or press Spacebar in the text box. As you type, filter attributes matching the typed letter display. If you press Spacebar, standard filter attributes display. These suggestions are part of typeahead, which helps build valid queries. For information about the attribute name and supported values for each field, hover over the field in an existing query. Select an attribute and press Enter. Press Spacebar to display a drop-down list of operators. Select an operator and press Enter. For attribute values that support typeahead, press Spacebar to display a drop-down list of values and press Enter. Click in the text box and press Enter or click Search. The list displays the results that match the specified filter. If the histograms are showing, they are redrawn to show only the values for the selected filter. The filter is added to the Recently Run list. Filter attributes, their names as they are displayed in Cloudera Manager, their types, and descriptions, are enumerated below. Note: Only attributes where the Supports Filtering? column value is TRUE appear in the Workload Summary section. NUMBER FALSE The sum of memory in MB allocated to the application's running containers. Called 'allocated_mb' in searches. NUMBER TRUE The amount of memory the application has allocated (megabyte-seconds). Called 'allocated_memory_seconds' in searches. NUMBER FALSE The sum of virtual cores allocated to the application's running containers. Called 'allocated_vcores' in searches. NUMBER TRUE The amount of CPU resources the application has allocated (virtual core-seconds). Called 'allocated_vcore_seconds' in searches. STRING FALSE The ID of the YARN application. Called 'application_id' in searches. STRING TRUE The state of this YARN application. This reflects the ResourceManager state while the application is running and the JobHistory Server state after the application has completed. Called 'state' in searches. STRING FALSE A list of tags for the application. Called 'application_tags' in searches. STRING TRUE The type of the YARN application. Called 'application_type' in searches. BYTES TRUE Bytes read. Called 'bytes_read' in searches. BYTES TRUE Bytes written. Called 'bytes_written' in searches. NUMBER TRUE Combine input records. Called 'combine_input_records' in searches. NUMBER TRUE Combine output records. Called 'combine_output_records' in searches. BYTES TRUE Total committed heap usage. Called 'committed_heap_bytes' in searches. NUMBER TRUE The number of completed map and reduce tasks in this MapReduce job. Called 'tasks_completed' in searches. Available only for running jobs. NUMBER TRUE CPU allocation. This is the sum of 'vcores_millis_maps' and 'vcores_millis_reduces'. Called 'vcores_millis' in searches. MILLISECONDS TRUE CPU time. Called 'cpu_milliseconds' in searches. NUMBER TRUE Data local maps. Called 'data_local_maps' in searches. NUMBER TRUE The number of data local maps as a percentage of the total number of maps. Called 'data_local_maps_percentage' in searches. STRING FALSE Diagnostic information on the YARN application. If the diagnostic information is long, this may only contain the beginning of the information. Called 'diagnostics' in searches. MILLISECONDS TRUE How long YARN took to run this application. Called 'application_duration' in searches. BOOLEAN FALSE Whether the YARN application is currently running. Called 'executing' in searches. NUMBER TRUE The number of failed map and reduce attempts for this MapReduce job. Called 'failed_tasks_attempts' in searches. Available only for failed jobs. NUMBER TRUE The number of failed map attempts for this MapReduce job. Called 'failed_map_attempts' in searches. Available only for running jobs. NUMBER TRUE Failed maps. Called 'num_failed_maps' in searches. NUMBER TRUE The number of failed reduce attempts for this MapReduce job. Called 'failed_reduce_attempts' in searches. Available only for running jobs. NUMBER TRUE Failed reduces. Called 'num_failed_reduces' in searches. NUMBER TRUE Failed shuffles. Called 'failed_shuffle' in searches. NUMBER TRUE The total number of failed tasks. This is the sum of 'num_failed_maps' and 'num_failed_reduces'. Called 'num_failed_tasks' in searches. MILLISECONDS TRUE Fallow map slots time. Called 'fallow_slots_millis_maps' in searches. MILLISECONDS TRUE Fallow reduce slots time. Called 'fallow_slots_millis_reduces' in searches. MILLISECONDS TRUE Total fallow slots time. This is the sum of 'fallow_slots_millis_maps' and 'fallow_slots_millis_reduces'. Called 'fallow_slots_millis' in searches. BYTES TRUE File bytes read. Called 'file_bytes_read' in searches. BYTES TRUE File bytes written. Called 'file_bytes_written' in searches. NUMBER TRUE File large read operations. Called 'file_large_read_ops' in searches. NUMBER TRUE File read operations. Called 'file_read_ops' in searches. NUMBER TRUE File write operations. Called 'file_large_write_ops' in searches. MILLISECONDS TRUE Garbage collection time. Called 'gc_time_millis' in searches. BYTES TRUE HDFS bytes read. Called 'hdfs_bytes_read' in searches. BYTES TRUE HDFS bytes written. Called 'hdfs_bytes_written' in searches. NUMBER TRUE HDFS large read operations. Called 'hdfs_large_read_ops' in searches. NUMBER TRUE HDFS read operations. Called 'hdfs_read_ops' in searches. NUMBER TRUE HDFS write operations. Called 'hdfs_write_ops' in searches. STRING FALSE If this MapReduce job ran as a part of a Hive query, this field contains the ID of the Hive query. Called 'hive_query_id' in searches. STRING TRUE If this MapReduce job ran as a part of a Hive query, this field contains the string of the query. Called 'hive_query_string' in searches. STRING TRUE If this MapReduce job ran as a part of a Hive query on a secured cluster using impersonation, this field contains the name of the user that initiated the query. Called 'hive_sentry_subject_name' in searches. STRING TRUE The input directory for this MapReduce job. Called 'input_dir' in searches. BYTES TRUE Input split bytes. Called 'split_raw_bytes' in searches. NUMBER TRUE The number of map and reduce attempts that were killed by user(s) for this MapReduce job. Called 'killed_tasks_attempts' in searches. Available only for killed jobs. NUMBER TRUE The number of map attempts killed by user(s) for this MapReduce job. Called 'killed_map_attempts' in searches. Available only for running jobs. NUMBER TRUE The number of reduce attempts killed by user(s) for this MapReduce job. Called 'killed_reduce_attempts' in searches. Available only for running jobs. NUMBER TRUE Launched map tasks. Called 'total_launched_maps' in searches. NUMBER TRUE Launched reduce tasks. Called 'total_launched_reduces' in searches. NUMBER TRUE The number of map and reduce attempts in NEW state for this MapReduce job. Called 'new_tasks_attempts' in searches. Available only for running jobs. NUMBER TRUE The number of map attempts in NEW state for this MapReduce job. Called 'new_map_attempts' in searches. Available only for running jobs. STRING TRUE The class used by the map tasks in this MapReduce job. Called 'mapper_class' in searches. You can search for the mapper class using the class name alone, for example 'QuasiMonteCarlo$QmcMapper', or the fully qualified classname, for example, 'org.apache.hadoop.examples.QuasiMonteCarlo$QmcMapper'. NUMBER TRUE Map CPU allocation. Called 'vcores_millis_maps' in searches. NUMBER TRUE Map input records. Called 'map_input_records' in searches. NUMBER TRUE Map memory allocation. Called 'mb_millis_maps' in searches. BYTES TRUE Map output bytes. Called 'map_output_bytes' in searches. BYTES TRUE Map output materialized bytes. Called 'map_output_materialized_bytes' in searches. NUMBER TRUE Map output records. Called 'map_output_records' in searches. NUMBER TRUE The percentage of maps completed for this MapReduce job. Called 'map_progress' in searches. Available only for running jobs. NUMBER TRUE The number of map tasks completed as a part of this MapReduce job. Called 'maps_completed' in searches. MILLISECONDS TRUE Total time spent by all maps in occupied slots. Called 'slots_millis_maps' in searches. NUMBER TRUE The number of maps waiting to be run for this MapReduce job. Called 'maps_pending' in searches. Available only for running jobs. NUMBER TRUE The number of maps currently running for this MapReduce job. Called 'maps_running' in searches. Available only for running jobs. NUMBER TRUE The number of Map tasks in this MapReduce job. Called 'maps_total' in searches. NUMBER TRUE Total memory allocation. This is the sum of 'mb_millis_maps' and 'mb_millis_reduces'. Called 'mb_millis' in searches. NUMBER TRUE Merged map outputs. Called 'merged_map_outputs' in searches. STRING TRUE Name of the YARN application. Called 'name' in searches. STRING FALSE If this MapReduce job ran as a part of an Oozie workflow, this field contains the ID of the Oozie workflow. Called 'oozie_id' in searches. NUMBER TRUE Other local maps. Called 'other_local_maps' in searches. NUMBER TRUE The number of other local maps as a percentage of the total number of maps. Called 'other_local_maps_percentage' in searches. STRING TRUE The output directory for this MapReduce job. Called 'output_dir' in searches. NUMBER TRUE The number of maps and reduces waiting to be run for this MapReduce job. Called 'tasks_pending' in searches. Available only for running jobs. BYTES TRUE Physical memory. Called 'physical_memory_bytes' in searches. STRING FALSE If this MapReduce job ran as a part of a Pig script, this field contains the ID of the Pig script. Called 'pig_id' in searches. STRING TRUE The name of the resource pool in which this application ran. Called 'pool' in searches. Within YARN, a pool is referred to as a queue. NUMBER TRUE The progress reported by the application. Called 'progress' in searches. NUMBER TRUE Rack local maps. Called 'rack_local_maps' in searches. NUMBER TRUE The number of rack local maps as a percentage of the total number of maps. Called 'rack_local_maps_percentage' in searches. NUMBER TRUE The number of reduce attempts in NEW state for this MapReduce job. Called 'new_reduce_attempts' in searches. Available only for running jobs. STRING TRUE The class used by the reduce tasks in this MapReduce job. Called 'reducer_class' in searches. You can search for the reducer class using the class name alone, for example 'QuasiMonteCarlo$QmcReducer', or fully qualified classname, for example, 'org.apache.hadoop.examples.QuasiMonteCarlo$QmcReducer'. NUMBER TRUE Reduce CPU allocation. Called 'vcores_millis_reduces' in searches. NUMBER TRUE Reduce input groups. Called 'reduce_input_groups' in searches. NUMBER TRUE Reduce input records. Called 'reduce_input_records' in searches. NUMBER TRUE Reduce memory allocation. Called 'mb_millis_reduces' in searches. NUMBER TRUE Reduce output records. Called 'reduce_output_records' in searches. NUMBER TRUE The percentage of reduces completed for this MapReduce job. Called 'reduce_progress' in searches. Available only for running jobs. NUMBER TRUE The number of reduce tasks completed as a part of this MapReduce job. Called 'reduces_completed' in searches. BYTES TRUE Reduce shuffle bytes. Called 'reduce_shuffle_bytes' in searches. MILLISECONDS TRUE Total time spent by all reduces in occupied slots. Called 'slots_millis_reduces' in searches. NUMBER TRUE The number of reduces waiting to be run for this MapReduce job. Called 'reduces_pending' in searches. Available only for running jobs. NUMBER TRUE The number of reduces currently running for this MapReduce job. Called 'reduces_running' in searches. Available only for running jobs. NUMBER TRUE The number of reduce tasks in this MapReduce job. Called 'reduces_total' in searches. NUMBER FALSE The number of containers currently running for the application. Called 'running_containers' in searches. NUMBER TRUE The number of map and reduce attempts currently running for this MapReduce job. Called 'running_tasks_attempts' in searches. Available only for running jobs. NUMBER TRUE The number of running map attempts for this MapReduce job. Called 'running_map_attempts' in searches. Available only for running jobs. Running MapReduce Application Information Retrieval Duration. NUMBER TRUE How long it took, in seconds, to retrieve information about the MapReduce application. NUMBER TRUE The number of maps and reduces currently running for this MapReduce job. Called 'tasks_running' in searches. Available only for running jobs. NUMBER TRUE The number of running reduce attempts for this MapReduce job. Called 'running_reduce_attempts' in searches. Available only for running jobs. STRING FALSE The name of the YARN service. Called 'service_name' in searches. NUMBER TRUE Shuffle bad ID errors. Called 'shuffle_errors_bad_id' in searches. NUMBER TRUE Shuffle connection errors. Called 'shuffle_errors_connection' in searches. NUMBER TRUE Shuffled maps. Called 'shuffled_maps' in searches. NUMBER TRUE Shuffle IO errors. Called 'shuffle_errors_io' in searches. NUMBER TRUE Shuffle wrong length errors. Called 'shuffle_errors_wrong_length' in searches. NUMBER TRUE Shuffle wrong map errors. Called 'shuffle_errors_wrong_map' in searches. NUMBER TRUE Shuffle wrong reduce errors. Called 'shuffle_errors_wrong_reduce' in searches. MILLISECONDS TRUE Total slots time. This is the sum of 'slots_millis_maps' and 'slots_millis_reduces'. Called 'slots_millis' in searches. NUMBER TRUE Spilled Records. Called 'spilled_records' in searches. NUMBER TRUE The number of successful map and reduce attempts for this MapReduce job. Called 'successful_tasks_attempts' in searches. Available only for successful jobs. NUMBER TRUE The number of successful map attempts for this MapReduce job. Called 'successful_map_attempts' in searches. Available only for running jobs. NUMBER TRUE The number of successful reduce attempts for this MapReduce job. Called 'successful_reduce_attempts' in searches. Available only for running jobs. NUMBER TRUE The number of map and reduce tasks in this MapReduce job. Called 'tasks_total' in searches. Available only for running jobs. NUMBER TRUE The total number of tasks. This is the sum of 'total_launched_maps' and 'total_launched_reduces'. Called 'total_launched_tasks' in searches. STRING FALSE The MapReduce application tracking URL. BOOLEAN FALSE Whether this MapReduce job is uberized - running completely in the ApplicationMaster. Called 'uberized' in searches. Available only for running jobs. NUMBER TRUE The amount of memory the application has allocated but not used (megabyte-seconds). This metric is available only from CDH 5.7 onwards and is calculated hourly if container usage metric aggregation is enabled. Called 'unused_memory_seconds' in searches. NUMBER TRUE The amount of CPU resources the application has allocated but not used (virtual core-seconds). This metric is available only from CDH 5.7 onwards and is calculated hourly if container usage metric aggregation is enabled. Called 'unused_vcore_seconds' in searches. NUMBER TRUE The maximum container memory usage for a YARN application. This metric is calculated hourly if container usage metric aggregation is enabled and a Cloudera Manager Container Usage Metrics Directory is specified. For information about how to enable metric aggregation and the Container Usage Metrics Directory, see Enabling the Cluster Utilization Report. STRING TRUE The user who ran the YARN application. Called 'user' in searches. BYTES TRUE Virtual memory. Called 'virtual_memory_bytes' in searches. MILLISECONDS TRUE Attribute measuring the sum of CPU time used by all threads of the query, in milliseconds. Called 'work_cpu_time' in searches. For Impala queries, CPU time is calculated based on the 'TotalCpuTime' metric. For YARN MapReduce applications, this is calculated from the 'cpu_milliseconds' metric. The filter attributes are user, rowsProduced, fileFormats, and executing. The operators are =, >, and RLIKE. The filter values are root, 0, .TEXT. *, and true. From the YARN page in Cloudera Manager, click the Applications menu. On the upper right, above the list of YARN applications, click the button Collect Diagnostics Data. If applicable, the Cloudera Support ticket number of the issue being experienced on the cluster. Optionally, add a comment to help the support team understand the issue. Click the checkbox Send Diagnostic Data to Cloudera. Click the button Collect and Send Diagnostic Data. Passwords from configuration will not be retrieved.